The SVG Way: Difference between Virus, Worms, Trojan Horse, Adwares, Spywares, etc. Malware is an acronym for Malicious-Software, and is a general term used to describe all of the viruses, worms, spyware, and pretty much anything that is specifically designed to cause harm to your PC or steal your information. It is a Big Umbrella Term, used to cover Viruses, Worms, Trojans and even exploit code. But it does not refer to vulnerabilities in softwares or a buggy code, or products whose business practices you don't agree with. Though the term Virus is often used interchangeably with Malware, but both of them don't have the same meaning. A Virus is a program that when executed replicates by inserting copies into computer programs, files or boot sector of the hard disk. 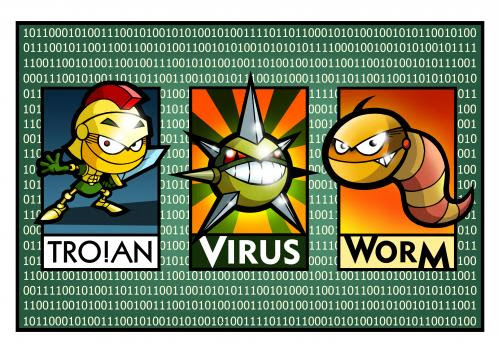 Similar to living Viruses, these Virus codes act parasitically, i.e by infecting innocent files and keeps infecting more and more files whenever that infected file is run. Some Viruses can affect the system adversely and leave it completely inoperable while some are just written to annoy the user by disabling some system features and creating havoc. Viruses needs a human action or a sequence of triggered actions to initiate itself. So most of the viruses attach them self to the commonly executable files, which when run will eventually trigger them and helps them to spread. Unfortunately, most of the Viruses are inadvertently initiated by the computer user themselves, and hence it is important that you make sure that the program you got is from a trusted source before executing it. Worms are somewhat similar to the Viruses, where they both replicate and spread. Unlike a Virus, a Worm is a standalone program that doesn't require user intervention to spread. Worms don’t infect existing files rather than that they spread copies of themselves instead. Computer worms use the network to send copies of themselves to other PCs, usually utilizing a security hole to travel from one host to the other. A worm always seeks for network loopholes to replicate from computer to computer and thus most common way of intrusion are emails and IM attachments. As the infection is network-based, a good firewall along with antivirus is necessary to control worm attack. Also, this means that blindly downloading email attachments or clicking the links friends share with you in a chat window isn't’t recommended. Double-check before you do that. 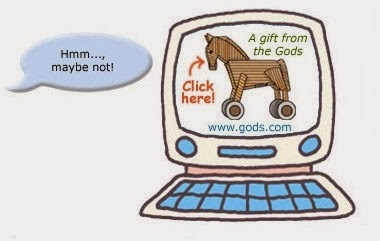 Trojan horse or simply Trojan, is a program that appears useful by pretending to do certain things in foreground, but in reality they are working silently in background with the only objective of harming your computer and/or stealing valuable information. In many cases, Trojans will create a backdoor that allows your PC to be remotely controlled, either directly or as part of a botnet - a network of computers also infected with a Trojan or other malicious software. The major difference between a virus and a Trojan is that Trojans don't replicate themselves—they must be installed by an unwitting user. Once your PC has been infected with the Trojan, it can be used for any number of wicked and criminal purposes, like a denial of service (DoS) attack against a web site, a proxy server for concealing attacks, or even worse—for sending out spams. 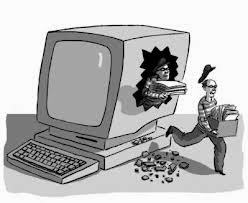 Spyware is any software installed on your PC that collects your information without your knowledge, and sends that information back to the creator so they can use your personal information in some wicked and criminal way. This could include key-logging to learn your passwords, watching your searching habits, changing out your browser home and search pages, adding annoying and unpleasant browser toolbar, or just stealing your passwords and credit card numbers. Since spyware is primarily meant to make money at your expense, it doesn't usually kill your PC. Therefore again it’s always advisable to download and install software from trusted sources only. Ad-ware, or Advertising-supported software, is any software package which automatically renders advertisements in order to generate revenue for its author. The term is sometimes used to refer to software that displays unwanted advertisements. Generally such ling of Ads are presented as a Pop-up. 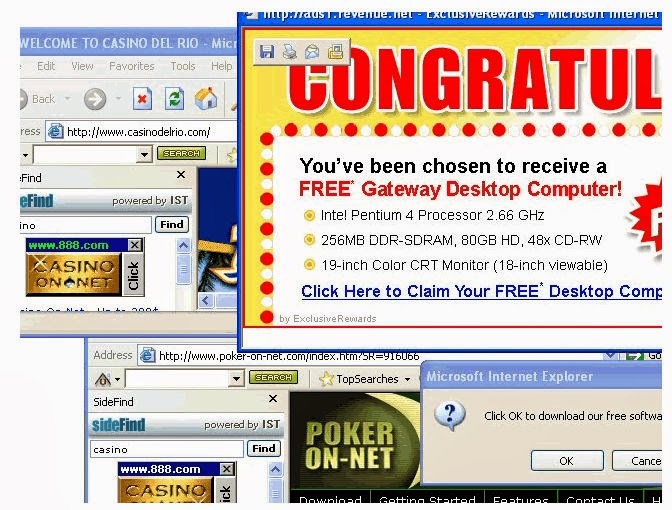 Such kind of ads contains data to irritate, scare or sometimes send Viruses and Trojans to the victims system. Root-kits are computer programs that are designed by attackers to gain root or administrative access to your computer. Once an attacker gains admin privilege, it becomes a cakewalk for him to exploit your system. Root-kits run at the same privilege levels as most antivirus programs. This makes them that much harder to remove as the computer cannot decide on which program has a greater authority to shut down the other. Rootkits may piggyback along with software that you thought you trusted. Another way to get infected is by standard viral infection techniques – either through shared disks and drives with infected web content. The idea has often been suggested that computer manufacturers pre-install backdoors on their systems to provide technical support for customers, but this has never been reliably verified. 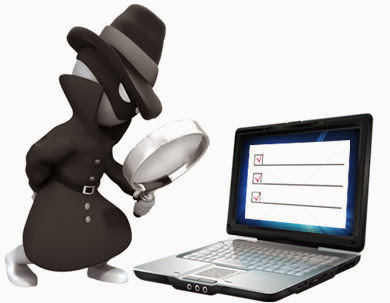 Crackers typically use backdoors to secure remote access to a computer, while attempting to remain hidden from casual inspection. To install backdoors crackers may use Trojan horses, worms, or other methods. Now you are quite familiar with the various terms and from now on-wards you should think it once before referring any suspicious activity in your system as a Virus attack. If it irritates you when somebody calls a Adware a Virus ? Be sure to send this article to them.